[CES 2009] Scenes From The Show | OhGizmo! 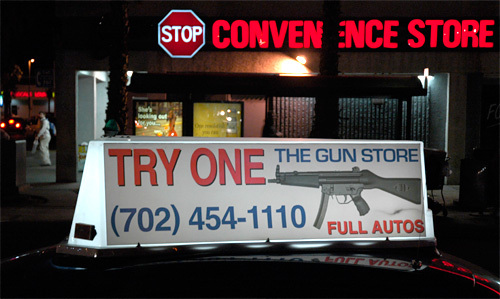 I went to one of Las Vegas's machine gun range with a friend a few years ago. We burned thru $250 of ammo, including the rental of 4 different types of weapons, in about 30 mins. It was a blast though! My favorite was the old .45ACP Thompson from pre-WW2 days. Highly recommended for experienced gun lovers. If you aren't experience I suggest going to your local range and get some experience starting with a .22 and move up from there. I did this at CES 2009. At the time they had a package for 299 (now 349) to shoot the wall. I shot 12 machine guns, ammo and targets included. It was a blast!!!!!!!!! The M249 was my favorite, the whole room shook when I fired. The MP5 was probably the most accurate, but I think next time, I'll just buy 300.00 in belt for the m249 and blast away. IT'S WORTH IT!!!!!!!!!!!!!!!!!!!!! !